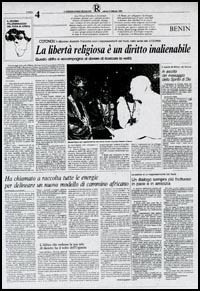 Meeting with a voodoo high-priest on February 4, 1993 during his visit to Benin, John Paul II gives the rationale to justify voodoo worship according to the principles of Vatican II. 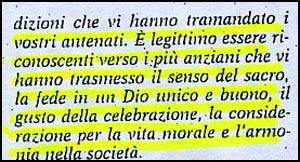 It is the first time in History that a Pope praised a worship that explicitly worships the Devil. At right, page 4 of L'Osservatore Romano and photocopies of the first part of John Paul II's greeting in Italian. Below, our translation of the part highlighted in yellow. I am pleased to have this occasion to meet you, and I very cordially greet you. As you know, I came to Benin principally to visit with the Catholic community, to encourage it and confirm it in the faith. However, I have always thought that contact with persons who belong to other religious traditions is an important part of my ministry. Indeed, the Catholic Church is favorable to dialogue: dialogue with Christians of other churches and ecclesial communities, dialogue with believers of other spiritual families, and dialogue even with those who do not profess any religion. The Church establishes positive and constructive relations with persons and human groups of other creeds for a reciprocal enrichment. These provide the foundations for a fruitful dialogue, as the Apostle Paul said to the first Christians: “Everything that is true, noble, just, pure, amiable, honorable, whatever is virtuous and deserves praise, let all these things be the object of your thinking.” From this comes our approach of respect [toward you]: respect for true values wherever they are, and overall respect for the man who looks to live these values that help him set aside fear. You are strongly attached to the traditions which your ancestors transmitted to you. It is legitimate to be grateful to the ancestors who transmitted to you the sense of the sacral, faith in a one and good god, the taste for celebrations, and consideration for moral life and harmony in society.